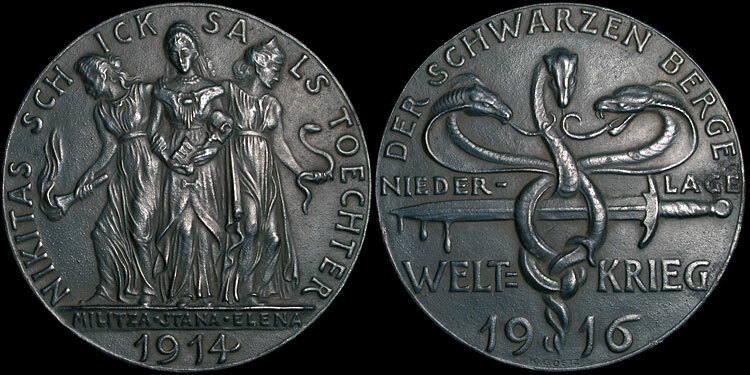 1916, Blackened Cast Iron (War Issue) Medallion, 82.6mm, 88.0gr. Obverse: Three of King Nicholas of Montenegro daughters represented as evil symbols of countries they adopted by marriage. Militza, wife of Grand Duke Peter of Russia carrying a lit torch; Stria, wife of Grand Duke Nicholas of Russia carrying a skull; and Elena, Queen of Italy carrying a snake. None are going to win any beauty contest. Reverse: Three entangled cobras over bloody broadsword. "The defeat of the black mountains (of Montenegro), World War 1916,"